When you first receive orders to PCS overseas, your initial concerns will likely be about the logistics of the move. But at some point, you'll begin to wonder what to expect and what life in another country will really be like for your military family. We polled some of the staff here at MilitaryByOwner, as well as a few of our blogging friends, and we can all agree on one thing. What you're expecting is probably not what your reality will be! See if your experience mirrors what we found surprising about life overseas. Whether you're in Europe, Asia, or somewhere else, you'll likely be closer to your dream vacation destinations than ever before! Take advantage of discount travel packages, lower plane and train fares, as well as advice from other well-traveled military families for your opportunity to see the world! I was pleasantly surprised how easy it was to travel and how friendly the people were. I don't know if it's different now, but one thing I was surprised about was that the road signs didn't refer to North, South, West, or East--only to the town in that direction. We always researched ahead of time before any trip to know the names of towns in the direction that we were going. We loved Germany! I'd say that living overseas and taking advantage of that new geographical location by traveling is one of the best things that could happen to you. You start to realize how small this big world really is. You begin to see different cultures, people, and ways of life from a new view which forces you to grow as an individual. While getting to experience things that you never could back in the U.S., it also gives you an appreciation for the small things back home as well! Especially if you're on an island or don't know the language, you may feel isolated at times. Take the time to connect with other military families or find a spouses' group so you don't feel so alone! One thing I wasn't expecting was how isolating living overseas can feel. Okinawa is in the middle of the Pacific Ocean, so traveling off island isn't always practical considering the expense. Also, the Japanese culture/language is so different from ours that it made it difficult at times. When you can't read street signs, names of stores, your own off base utility bills, etc. it makes you really have to research when you do things. All I can say is that I am SO GRATEFUL for the internet and iPhones when living overseas. I give credit to all those military folk that lived overseas before the internet! One difference I loved when we lived in Germany was the way in which people typically say "hello" and "goodbye" or greet in passing. We've found that, for the most part, when we attempted to speak the little bit of the language that we could, it was usually accepted readily and with great appreciation. When we found out that we were moving overseas, I thought I would be intimidated to go off base because of language barriers, cultural differences, and the driving being different. I was surprised to find out that going off base and socializing with people was easier than trying to socialize on base. I was pleasantly surprised to find out how nicer the local people actually are. Much nicer than most Americans. If we ask for directions, the person usually ends up walking us to the location even if it a dozen blocks away. Still, after you've unpacked and gotten your family settled as best as you can, you may feel like a fish out of water for some time, as even simple everyday tasks like how to handle recycling varies from country to country. I was surprised that it took me as long as it did—a good six months—before I felt comfortable living in Italy. I've traveled overseas and I lived in England before our assignment in Italy, so thought I would acclimate sooner than I did. My advice to help anyone get into a groove sooner rather than later is to completely immerse yourself in the culture. Learn the language and at least attempt to speak it with the locals. Start with learning the basics for food—a common factor between everyone—and go from there. They'll forgive you and help you adjust if they see you try. Knowing how to literally speak their language will go a long way! The learning curve threw me for a loop. I expected the culture shock and language barrier to some degree, but I was surprised to find myself having to figure out how to do simple things like turn on the lights, flush the toilets, and take out the trash! Ha! Also, coming from mild Texas winters and summer heat, my wardrobe was not prepared for the rain, chilly temps, and full range of seasons. I miss my flip-flops, but I wouldn’t trade the experiences we’ve had here over the last year for anything! After you've lived in another country, returning back to the U.S. may be surprisingly challenging. On one of our first shopping trips when we came back from Guam, I recall facing a wall of over-the-counter ibuprofen and being overwhelmed at the staggering number of choices for one item! I was surprised at the low I felt returning to the U.S. After five years overseas, I was looking forward to seeing friends and family, having stores be open more hours, eating certain foods, etc. While I did enjoy all those things, a large part of me still longed to be back overseas. There is a Portugeuse word, saudade, that doesn't translate well into English but describes it perfectly..."a sense of melancholy and longing." We just returned from being overseas! Reverse culture shock is a real thing. Living overseas was an amazing opportunity that not many people take advantage of. If you ever get the opportunity to go overseas, take it! It's a once in a life opportunity and even though you get homesick, in the long run the memories you'll make will stay with you forever. I never realized how much my life would benefit from living in a different country. Not only did I grow as a person, but my mind was opened to other ways of living. I encourage everyone to go overseas if they can, even if they get homesick, because it is worth it and the opportunity might not come around again. Has your military family lived in another country? What was your experience? We'd love to hear what surprised YOU! 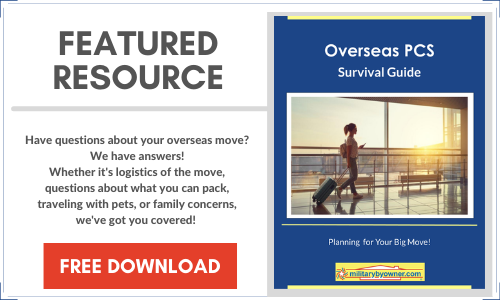 For more help for your overseas move, download MilitaryByOwner's newest free e-book, Overseas PCS Survival Guide!